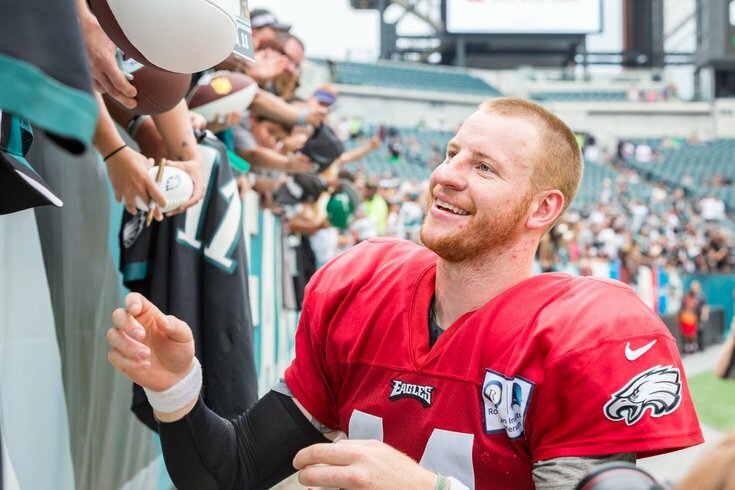 Carson Wentz signs autographs at the Eagles public practice on August 11 at Lincoln Financial Field. With the Philadelphia Eagles just 10 days away from kicking off the 2018 regular season against the Falcons at Lincoln Financial Field, ESPN has released its rankings of the top 100 players in the NFL — and the reigning world champs are well represented. In all, the Eagles had seven players make the list, tied with the Vikings for the most in the NFL. And of those seven players, six are newcomers to the list. Talk about a Super Bowl bump. The highest-ranked player was quarterback Carson Wentz, who, at 17th overall, was the fourth-highest QB on the list behind Aaron Rodgers (1), Tom Brady (2) and Drew Brees (6). Other quarterbacks ranked near Wentz include Ben Roethlisberger (18), Russell Wilson (19), and Matt Ryan (21). The only Eagles player making a return to the Top 100 is defensive tackle Fletcher Cox, who comes in at 29th, 28 spots better than a year ago. Only the Rams' Aaron Donald was ranked ahead of Cox in terms of interior defensive lineman. Gerald McCoy (46) was the only other to crack the Top 50. Lane Johnson, meanwhile, was the second-highest ranked offensive tackle behind Cowboys tackle Tyron Smith, and the third highest offensive lineman overall. So how did ESPN come up with their top 100 players? In case you're wondering how the rest of the NFC East fared, the Cowboys had five players in Top 100 (led by Ezekiel Elliott at No. 15), while the Giants and Redskins had three each.